Helping to teach children the way in which light passes through different objects, our Colour Paddles offer a lightweight and enjoyable play experience. 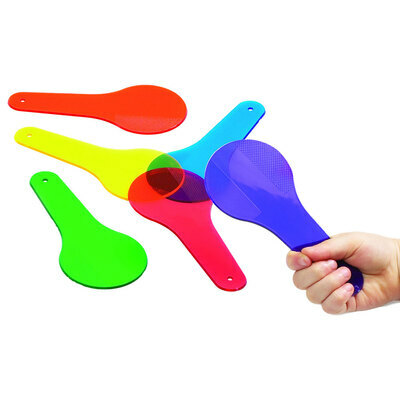 Provided in a pack of 6 vibrant and inviting colours, each paddle is completely flat in its design and presented in a transparent plastic material. A tapered handle has been sized specifically for smaller hands and each features a small drill hole at the end - ideal for stringing the entire pack together during storage. Encourage your class to hold these unique teaching tools up to the light and marvel at the colourful world around them or use in partnership with your school light box for an exciting play session. A fun and engaging tool that can also double up as a unique room decoration when strung together on a line. Considering pairing our Colour Paddles with other lines in our sensory collection such as our Jumbo Colour Mixing Shapes 6 Pk or our Colour Splats. We also stock our Sensory Mood Light Table, Wooden Light Table, Light Panel A2 and Light Panel A3 for a new world of light observation.